Imagine the most insulting thing you’ve ever been called. Whether it was stupid, ugly, fat, retarded, or anything else. Imagine being called that every day because of who you are. Not something you can change. Imagine being called that word, and that’s not who you are, just who other perceive you to be. 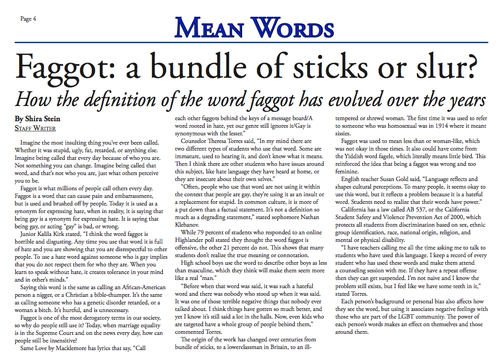 “Often, people who use that word are not using it within the context that people are gay, they’re using it as an insult or a replacement for stupid. In common culture, it is more of a put down than a factual statement. It’s not a definition so much as a degrading statement,” said sophomore Nathan Klebanov. “Before when that word was said, it was such a hateful word and there was nobody who stood up when it was said. It was one of those terrible negative things that nobody ever talked about. I think things have gotten so much better, and yet I know it’s still said a lot in the halls. Now, even kids who are targeted have a whole group of people behind them,” said Torres. “I have teachers calling me all the time asking me to talk to students who have used this language. I keep a record of every student who has used these words and make them attend a counseling session with me. If they have a repeat offense then they can get suspended. I’m not naive and I know the problem still exists, but I feel like we have some teeth in it,” said Torres. Previous Post America: the land of the free and home of the disheartened?